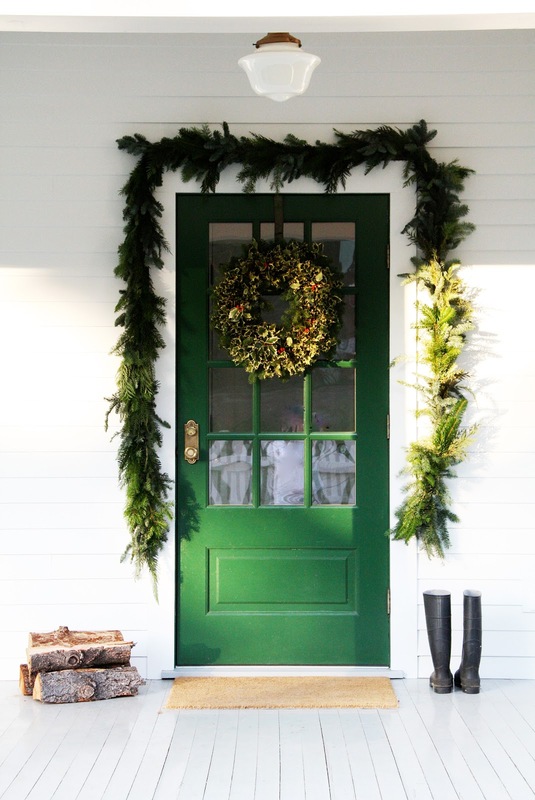 The door is dressed in garland and holly. that flourish into bright trumpet blossoms. melds perfectly with the fragrance of the evergreen garland. 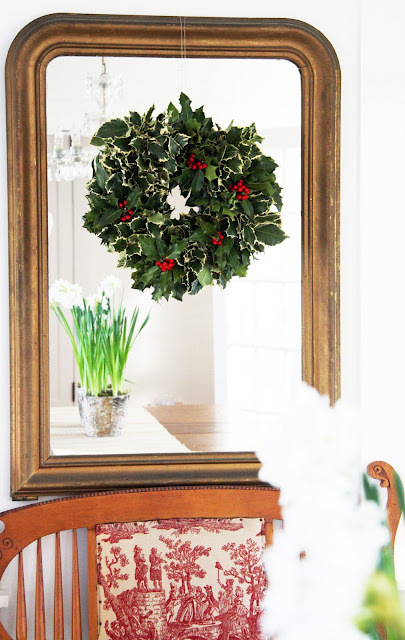 Holly wreaths adorn the doors and mirrors. The holly is prickly to the touch, but so beautiful once it's in place. has been celebrating the babies' birthdays. Our beautiful son and daughter turned one this past weekend. I took in an emotional breath as we celebrated our first year with the loveliest gifts we've ever known. They are perfect little miracles, and I still revel in being so blessed to be their mother. pumpkin (pumpkin birthday cake will have to wait until next year). Although hesitant at first, they liked their birthday pie very much! and the blessings of your wonderful families. Precious little babies. A blessing and a legacy that will continue on long after you are gone. The most very wonderfulest (yes so a made up word) gift you could ever be given! Oh, your blog is very elegant and lovely!! Birthday wishes to your twins! :)) cheers. As a great women once said, "Let them eat cake!" Looks like they enjoyed the pie though! This was such a heart-warming post. I just know how dearly you longed for exactly what you have now. It's so wonderful, and a miracle indeed!! Happy Birthday, Graham and Margaret! You make your Mommy and Daddy so happy and proud! P.S. The house looks so lovely in it's holiday dress! Enjoy each minute - even when it seems like a terrible moment - they all blend into a wonderful life. Lovely images, a beautiful Christmas. But what is most pleasing is those sweet faces of your children. 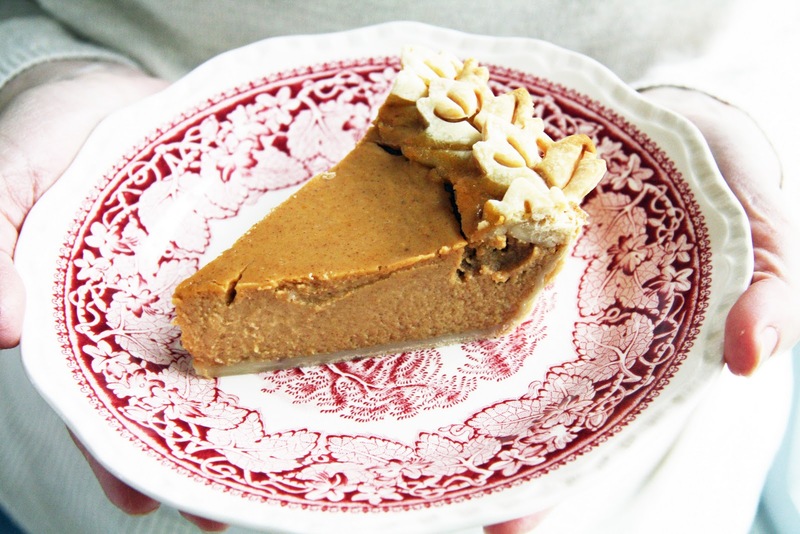 Also, love the plate that holds the yummy pumpkin pie! Is there a name for that pattern? What one, already! My twins will turn 19 in February and I am already thinking of the special cakes I will bake for them. They are home from college and the holidays are all the more special with children. Enjoy those beautiful babies. What a Christmas you will have! Everything: the children, the decorations...just beautiful! Happiest of Birthdays little pumpkin faces! You ARE so blessed! Gorgeous photos, lovely post and happy birthdays!! Green and white is such a fresh combination. The added bonus of flowers and scent is wonderful. So happy to see your new post (I've been checking daily!). Beautiful Christmas decorations, as always. The holly wreaths are especially pretty. HAPPY BIRTHDAY to Graham and Margaret. Their first birthday, how exciting! They are adorable. those babies are growing! !! I hope you and your family have a great holiday. Merry Christmas! !! Happy birthday to your dear little ones and may your Christmas be beautiful and your new year filled with peace, strength, health and many memories. Happy Birthday Graham & Margaret! May you enjoy this and many many more! Beautiful photos! 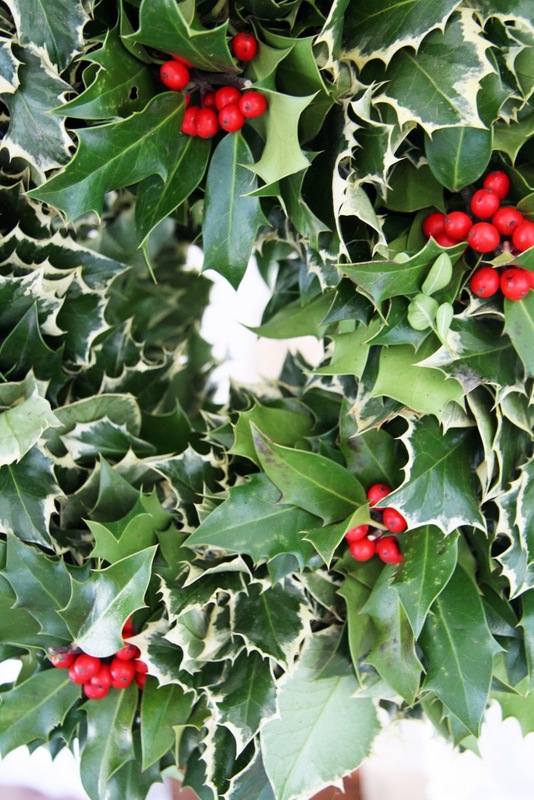 The holly is so pretty! Happy Birthday to your precious little ones! They totally look like they are loving that pumpkin pie! Also I love your tree with the cardinals on it - such a simple pop of colour. We always have a tree with feather birds on it too - this years it's on the sideboard in the kitchen. Love the adorned door . . . the hint of paper white fragrance . . . the Itsy Bitsy Spider eyes . . . Such Joy it is to open the door to a visit with you . . .
Hey, Graham eats pie just like I do! Beautiful photos as always, Trina! It seems that many people are turning to fresh greens and plants as their holiday decor and I LOVE it! What can be more beautiful? I hope you and your family have a wonderful, magical Christmas! Happy (belated) birthday to your beautiful babies! Yiur home looks lovely, dressed for the holidays. They are so adorable! What type of chair are they using? I enjoyed the picture of your home in Country Living. I love all your natural Christmas touches. I also love the name Margaret. So pretty! oh trina! they are absolutely gorgeous perfection wrapped in sweetness. does it get any better? nope. enjoy, enjoy, enjoy! Your sweet children are by far your finest gift. Happy Birthday little ones! Beautiful images of innocent, happy children. It does not matter that they do not smile, their eyes say it all. Happy Christmas to you ad your family. Happy 1st Birthday to those cuties! Our son has apple pie every year for his birthday. I hope you have a very Merry Christmas! I recently discovered your blog through another blog I read. You have incredible taste which is what initially captured my interest...but then I discovered you have a set of boy and girl twins (me too)! Mine will be six months this month on the 25th. They are a true blessing, especially since we both seem to have struggled to get them here. Anyway, I hope you and your family have a lovely holiday and Happy Birthday to Graham and Margaret! Thank you, thank you for letting us share your journey! And Happy Birthday to Graham and Margaret...they are adorable! Without question, you'll never get a better gift. Savor every moment as they'll be gone before you know it. Happy One Year of Motherhood! Such sweet babies - and I love the idea of making their birthday treat from their pumpkins. 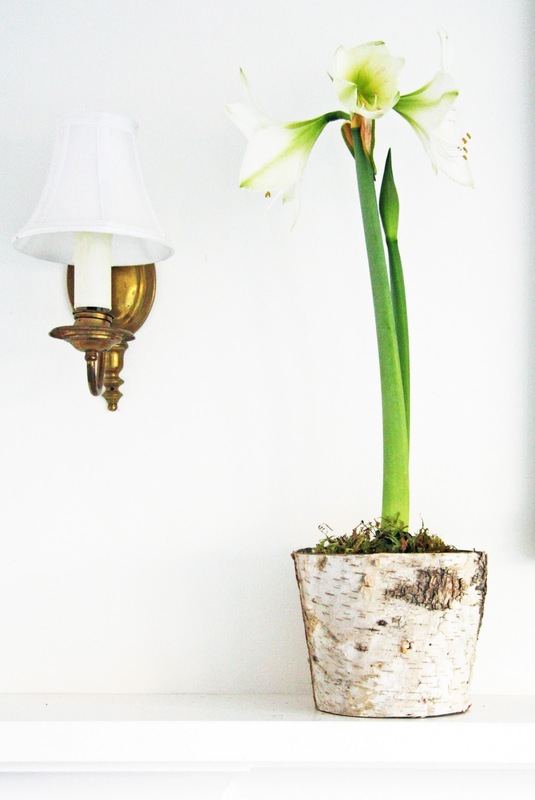 (I also adore those birch pots your flowers are growing in - fabulous!) Blessed Christmas to you. Simple beauty--just perfect. I feel the warmth and love in your family. Very pretty, loved the CL feature! Those babies are truly a gift from God!! How blessed you both are!! Have the happiest of holidays with your family. children are a great and wonderful gift!!! We have a adult son and after many years of trying for another bio child we were given throught the miracle of adoption 2 daughters now 9 and 6. I love the holidays with children in the house. There is something truly magical about seeing Christmas through their eyes. Enjoy. perfect! love the 'real' holly! Happy Birthday to Graham and Margaret! An entire year has passed, my goodness. They are just adorable. Your photo's are beautiful. I especially love the first one of your front door. Merry Christmas! What a wonderful way to celebrate the holidays with your babies' birthday! Hope you have a very Merry Christmas! Happy birthday to your precious little ones! It hardly seems it's been a year - they are growing so fast. Merry Christmas to you and your dear ones. Awe~ happy bday to your little angels and happy holidays to you. Your home looks warm and cozy and ready for the festivities. How precious and beautiful! I've been waiting for your latest post and have not, of course, been disappointed. Your home is lovely, and especially so with your two Best Presents! How quickly time passes. I feel like I know your family from reading your blog. Beautiful post. Love the one with the kids eating the pie. Happy Birthday to your two little sweeties! Oh, happy birthday, little ones:). They're getting to be so big and they are just adorable:). I am sure they're enjoying all of the beautiful Christmas-y colors and twinkle lights; probably much more aware of these things than they were last year:). Happy holidays to you and your beautiful family! Best Birthday wishes to your twins! 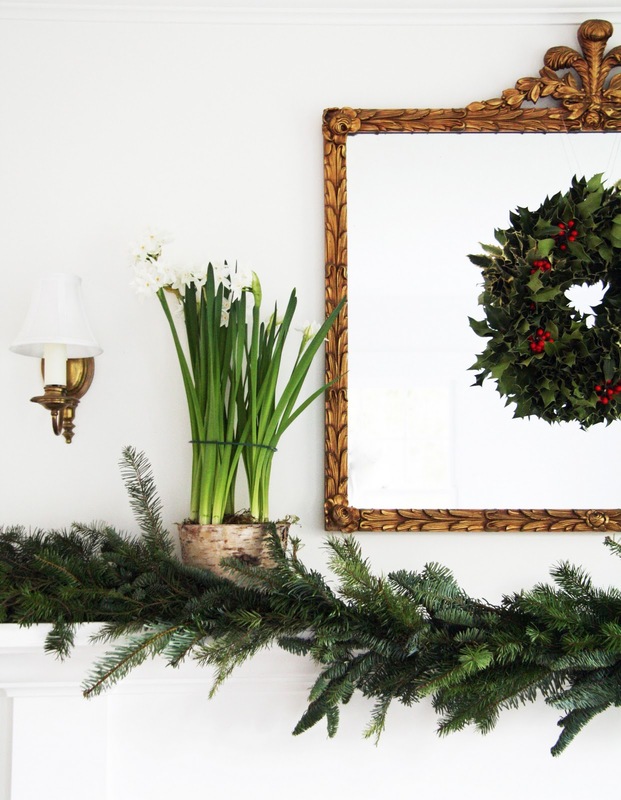 Love your simple holiday decorating style. Makes me want to throw out all my 'stuff'! Seriously! Oh my goodness, what precious children! Happy, happy birthday, Graham and Margaret! Hope your holidays are merry ones! Happiest Birthday to your little miracles! I chose high chairs by Anka. They're made with all wood and a non-toxic finish. Plus chair cushions are removable to wash. They're great! The transfer ware are called Mason's Vista England. Absolutely stunning! The first photo of your front door with the boots and the last one with your beautiful babies are my favorites! I can't believe they are already one! 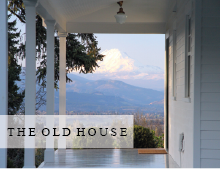 As I renovate my 140+ year old farmhouse, my thoughts keep coming back to your beautiful scenes. Your attention to detail, eye for simplicity, and consideration for our environment truly inspires. Thank you! Wishing you all a magical holiday. Love. Aww, Happy 1st Birthday babies! Your blog is absolutely divine and Your babies a true gift! Thank you for sharing and I hope your Holidays are amazing! Stunning front door and charming babies. Our boy twins will be 10 the 26th, no cake orders yet. Time flies. Have a wonderful Christmas and New Year! 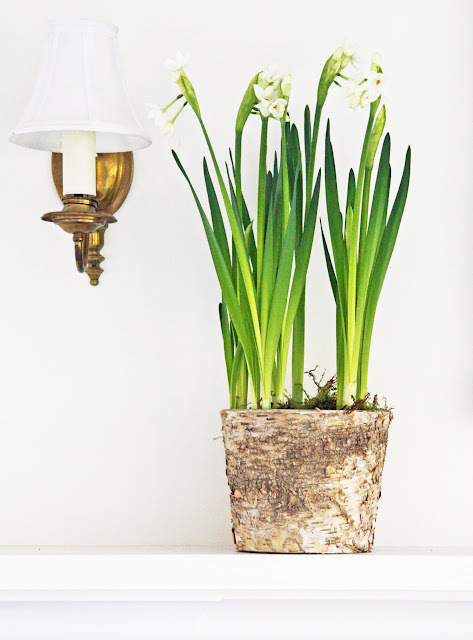 Thank you so much for your beautiful blog! Only you can make some boots and pieces of wood look beautiful! Then, those children! Oh my! I want one for Christmas,even though I do have 5 grands already! I can hardly believe a year has passed but you've captured it beautifully. Thanks for sharing their progress with us. love, love, love this post! It is absolute perfection... each and every photograph, but especially the one of Graham and Margaret eating their birthday pie!! Wishing you and Mike, the sweetpeas and Lucy the happiest of Holidays! Trina & Mike, Happy Birhtday x two, to you as well...your little angels are adorable, so very happy for you!! This will be such a special Christmas...they'll be lighting up with the discovery of it all this year!! I love how you decorated the front door to your home. Your home is beautifu. It's looks so effortless and calm. Too sweet my friend another wonderful post.Sending you special wishes for a very Merry Christmas and look forward to keeping in touch in 2012. Mike and Ashley still bring me unbelievable joy...enjoy your little miracles. Happy Christmas! Oh I so remember waiting for the 2 cherubs to arrive this time last year. And the excitement when Mike posted that the babies had been born & all was well. What a year it's been for you all & gee you have done so well! Congrats to Graham & Margaret for managing their parents so beautifully & first birthday kisses all round. Finally purchased my Country Living today; so happy to find one with your lovely living room on the cover! It was like reading about a friend . 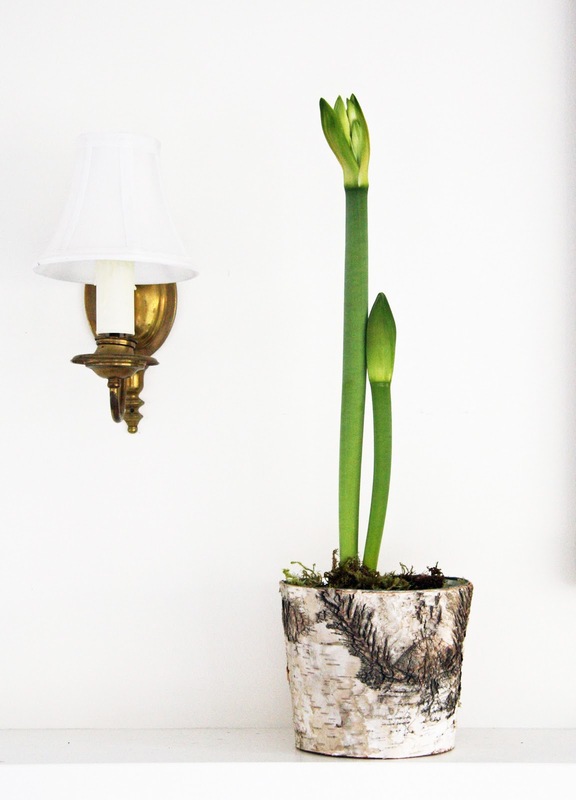 . . seeing your beautiful, serene rooms decorated for the holidays was such fun. And reading about the joy of your twins always does my heart good! I've commented before that as someone with infertility, I understand the heartache and longing, and I appreciate that it was included in the article - it gave it depth and meaning. Congratulations on such special, national recognition - - you both are SO deserving!! I've been following your blog for over a year. I remember reading about how you were wishing for them and finally having them. They are very cute. Cherish your motherhood every second. Merry xmas and happy new year!